A couple of months ago I posted a pedicure I did whereby I was complaining that my feet were so cold that I ended up smudging my nails by putting socks on too early. 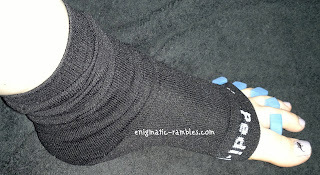 So when I was given the chance to review some Pedi-Sox I jumped at the chance, because I can't be the only one with the problem. 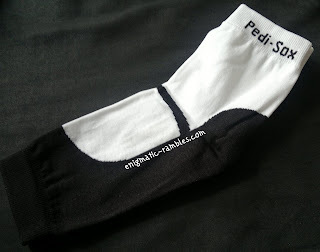 So what are 'Pedi -Sox'? 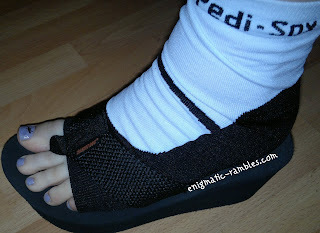 "Pedi-Sox® are unique one-of-a-kind toeless pedicure sock. 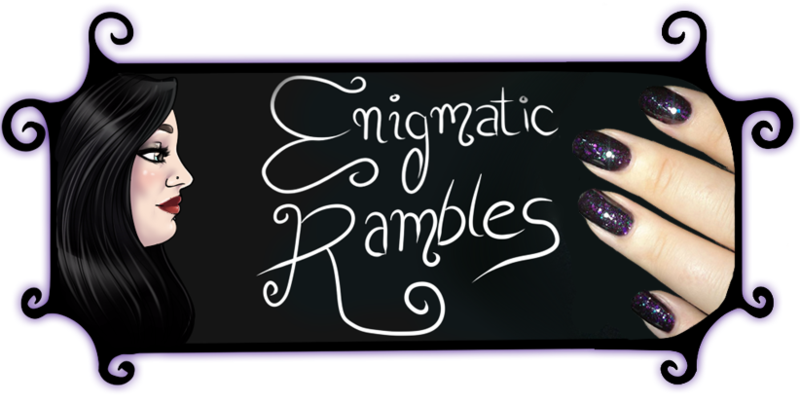 • Fun & Fashionable ...all this & more! Do they live up to the claims? 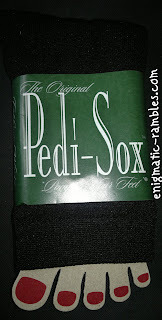 I was send a couple of different pairs of Pedi-Sox, and have tried them all out so I can fully review them. My feet were warm while I was doing my pedicure and once I had finished I could allow my polish to dry without my feet getting cold, which was a real problem of mine. My pedicure got to dry and look good without any sock marks denting or smudging my nails. Wearing these does encourage me to paint my toenails even when it is cold, which is quite a lot of the time living in Northern England. I was suffering from numb toes whilst painting them in December, which is not good! Applying a foot lotion and then wearing these really did help the lotion sink in to the skin and made my feet lovely and soft, so they do help in conjunction with a foot lotion. I used Soap & Glory Heel Genius. Of course wearing the Pedi-Sox did help my feet to not get bits of fluff on to them from the floor, and the claim is right your feet do seem to be a magnet for fluff if you apply a lotion and don't put on socks. 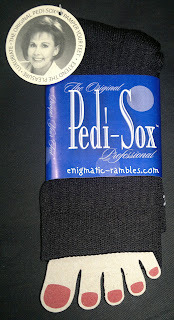 Looking at the Pedi-Sox individually, first off I tried the Professional Original ones in Black. 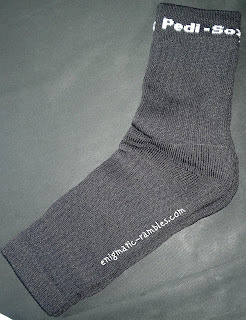 They are thick, more of a sports sock in thickness and they are fantastic for keeping my feet warm while it is cold and allowing me to do my pedicures. At the moment these come in six different colours. Next are the Lite California Summer ones, again in Black. 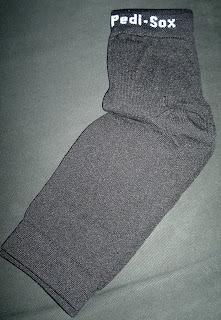 They are a lot thinner than the Professional ones, more like a trainer sock thickness, these are nice to use when it is relatively warm. You could probably get away without using Pedi-Sox while doing your pedicure, but if you are using a lotion then these are really good at keeping the fluff away from your feet and of course helping it to soak in. You won't end up with hot feet whilst wearing these. Right now these come in nine different designs. Lastly I have the Ultra Pedi-Sox and these ones are in the model 'Mary-Janes' they come in three different designs at the moment and I am especially liking the leopard print ones. These are particularly cute, with a clever design. Quite similar to the Lite California Summer Pedi-Sox, these aren't going to make your feet too hot during the summer but they will help with lotion absorption and stopping the fluff sticking to your feet. Overall I am really liking these, they have a little elasticated rib around the toe and ankle part of the Pedi-Sox which makes them quite unique. Even if you tried to make your own by cutting off the toes to some socks, that just isn't going to cut it. I have washed these and reused them and they wash and wear well. 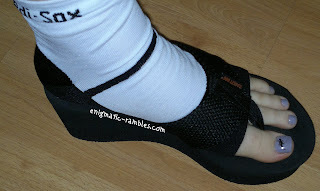 The Professional ones are perfect for winter and I am sure they will get a lot of use during the colder months. Coming in the the British 'Summer' now I will be opting to use the Lite ones so my pedicure dries perfectly and keeps the fluff off my feet whilst letting the lotion sin in to the skin making my feet summer ready. 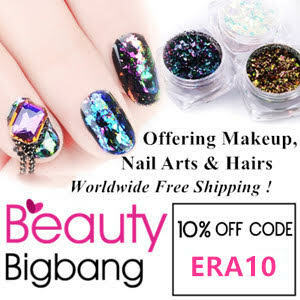 You can wear these with flip flops too so if you have to go do something you can wear them and not smudge your nails. Admittedly it does look slightly amusing, but its not exactly a fashion statement for walking down a high street in. My toes are a bit red from the toe dividers / separators. Well done if you have made it this far! I have a pair of Original Pedi-Sox to giveaway along with some Scholl Dry Skin Recovery Cream to help you to get lovely Summer Ready Feet. You can enter that here if you like. What a great idea! Sometimes in the winter time I neglect painting my toes because it is just too cold! I am excited to try this product.